Manager Garry Monk has guided Swansea to a club record Premier League total of 56 points this season. 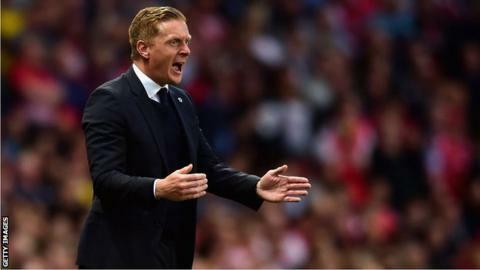 Manager Garry Monk says he is "not scared" of Swansea City qualifying for the Europa League next season. The Swans moved to within a point of seventh-placed Southampton after their 1-0 win over Arsenal at the Emirates. "I don't think we're scared about going in to that," said Monk, whose team lost in the last 32 in 2013-14. "We had a great experience last season in that, we really enjoyed it. "People talk about how it can affect your league form and we'll have to deal with it if we're in there." Monk was on the bench for the Swans' early Europa League ties at Malmo and Romanian side Petrolul Ploiesti in the 2013-14 campaign. By the end of that season he had succeeded Michael Laudrup as Swans manager and Monk accepts he would need a bigger squad to deal with the extra European fixtures. In addition to Arsenal winning the FA Cup, Swansea would need to gain points from their last two matches at home to Manchester City and away at Crystal Palace to finish seventh. "Of course I'm going to push the players in these last two games, we've pushed all season," added Monk. "You saw [against Arsenal] our application and attitude towards trying to win the game and get a result was clear so it won't change. "If we're in it [Europa League] we'll have to deal with it and the size of the squad will have to be expanded." Midfielder Gylfi Sigurdsson believes Swansea's chances of qualifying are slim. He said: "I'm pretty sure Tottenham or Southampton will win a couple of games before the end of the season and that would make it very hard for us. "We just want to get three or four points from the next two games and see where that leaves us."